It’s 4th and goal with seconds ticking away. The home team needs to score a touchdown to win the game and make the playoffs. It all comes down to this. It’s moments like this that remind Michael A. Stokes why he likes football. So much, in fact, he wants everyone to watch, learn and enjoy the game as much as he does. 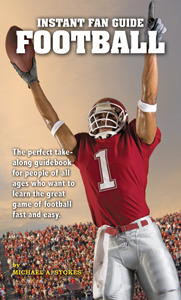 Stokes’ Instant Fan Guide Football Edition is the perfect take-along guidebook for people of all ages who want to learn the great game of football fast and easy. This 20-page, 4″x 6″ football reference is small enough to put in your back pocket or in a purse. As much as tailgating, it is the perfect companion to any football game.